ITS a tale of two counties – the cash-rich GAA in Dublin versus smaller counties struggling to keep their teams competing on the pitch. But hotelier Joe Dolan reckons he gets more bang for his buck sponsoring Leitrim GAA than communications giant Vodafone gets from its mega-deal with the Dubs. “The association with Leitrim GAA is worth 25 GAA club dinners a year to the hotel,” the owner of the Bush Hotel in Carrick-on-Shannon told the Sunday Independent. Its a world away from the Dubs, whose main sponsorship by Vodafone cost more than €3m over four years, encompassing an ultra-slick corporate relationship and carefully planned “development strategies to maximise commercial development”. The Bush Hotel, on the other hand, is a small, respected family business – “a meat and two veg” operation, as owner Joe puts it. His five-figure sponsorship means the Bush Hotel logo emblazoned on the county jersey has been seen all over the world, including by more than 19 million TV viewers in China and millions in the UK. “I was watching Ronnie OSullivan at the world snooker final on TV and there, near the front row in the Crucible in Sheffield, was a lad wearing a Leitrim jersey with the hotel logo. That event was seen everywhere, including on Chinese TV which showed the snooker hour after hour,” said Joe. The hotelier is proud of his association with his native county, and admits his decision to sponsor the GAA team came from the heart as much as the head. “Its a good fit for us,” he said. “We pride ourselves on being the peoples hotel with a strong local base. “With the GAA involvement comes links with the IFA and so the business benefits. 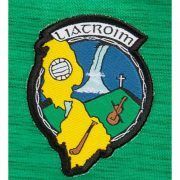 I give good value to Leitrim GAA and they give good value to me. “I get more bang for my buck pro rata than Vodafone gets from Dublin. “This is rural Ireland. People have a leaning and are drawn to the local GAA hotel, not just in Leitrim but, say, if Roscommon are playing in Carrick, where would all the fans be going for a few pints afterwards? They will all go to the local GAA place. “You have the direct return from the GAA, but from that you would also get people coming home from England visiting friends and relatives and they will know the name and will drop in when they visit Carrick. “And, of course, you get the other bits and pieces that go along with sponsoring the county. Its like buying a computer – you get add-ons which you didnt expect, like the hotel name at Scór functions and the county handball players, which does no harm at all. “Its a two-way street. Yes, it comes from the heart, but we are shrewd, tough business people. We need a return and we get a return from the sponsorship.